A fierce energy leaps out of the speakers in the opening bars of Anti-Arktos (Bears, or a Centaur in Greek) – it’s an immensely and viscerally exciting start to a recording that has you on the edge of your seat. Primary colours and textures abound in funky-shaped performances guided by the rolling thunder of Mark Kelso’s drums. All of this keeps the music in tight rein albeit the letting go of keyboard, alto saxophone, guitar and bass to gambol and improvise as if interminably. Mark Kelso’s rhythms and phrasing are precise and alert and if the band is tight in a sophisticated sort of way it’s exactly because of this. 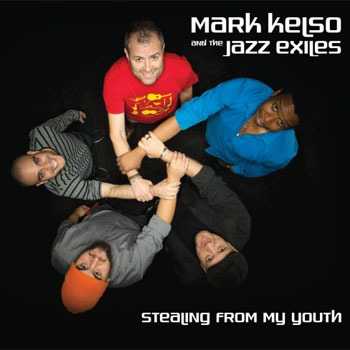 Having heard the jazz grooves of Mark Kelso, this is refreshingly different as he pays homage to the halcyon days in Stealing From My Youth, a trippy album of astounding vitality and winning resonance. I have always believed that Mark Kelso can play in any idiom and anyone who has heard the drummer with Hilario Durán will testify to the fact that he plays in clave with the tempest of vivacity, as if he were an Afro-Cuban. I cannot think of anyone else who can play like Mark Kelso today – except perhaps Peter Erskine, who played on some of the fine Weather Report albums. Mark Kelso has the power of a Titan and yet he can caress the skins and cymbals as if he were making love to a woman when the music demands. Tale a listen to For Where You Are Now and you will hear what I mean. On this track he captures the transcendent imagery of a ballad. Elsewhere he is a force of nature, his elemental thunder and lightning of a world of rhythms unfolds. The drummer can play some of the most complex time signatures you will ever hope to hear by a drummer on either side of the border. So successfully does he do it on this disc that you will be left breathless. This is an excellent album and feels like an elegant railway system linking rock and other rigorous musical metaphors with the freedom and rollicking splendour of jazz in the most formulated as well as its freest forms. But to describe as such might give the impression of overcooking when in fact the whole project is a masterpiece of subtlety. Mr Kelso and his Jazz Exiles take on the lineage of hot and picante music sees him summoning all that is primordial about a percussion-led ensemble. In bassist Rich Brown he has found an able doppelgänger who can mirror his burgeoning rhythms with two-handed party time thrills and spills. The bassist is not the only key to the success of this outfit. Saxophonist Luis Deniz, the phenomenal pianist Robi Botos and the brazen and monstrously talented guitarist Joey Martel also contribute immensely to the surging vigour of this disc. There is nothing benign or cool about this album. It is a hipness alert sent out to the cognoscenti that Mark Kelso and his band of merry men play their hearts out from one sunburst of a song to another. The musicians weave their harmonics like the molecules in the Double Helix in a rich and not entirely predictable foundation to the music. The surprises, when they come, are effective but discreet; a gamelan-like riff in Like A Finger Pointing To The Moon is played with pizzicato harmonics, and a delicate curlicue of a bass line underpins what sounds like the keening of a poet in a Celtic lament in the playing of Luis Deniz as he plays the solo on The Forbidden City, while throughout, close-knit passages develop from beautiful single phrases. The recorded sound balances detail and warmth. This one’s a keeper on a vaunted shelf. Track List: Anti Arktos (No Bears); Aqueous; Arktos (Bears); Bounce; For Where You Are Now; Fred’s Fast City; Like A Finger Pointing To The Moon; The Forbidden City; The Jazz Exiles; Whirlybird. Personnel: Luis Deniz: alto saxophone; Joey Martel: electric guitar and talkbox; Robi Botos: keyboards and piano; Rich Brown: electric bass; Mark Kelso: drums, percussion and vocals.